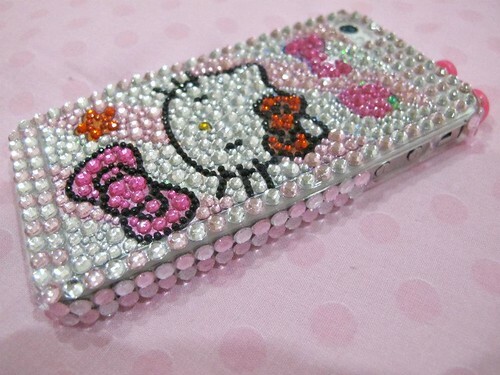 I finally found a proper Hello Kitty cover for my iPhone 4S. I've went to Digital Mall and also check online for it but it's either too expensive or looks ugly lmao. Actually my mom bought it for me :P It was handmade and the person who stick these appeared in magazine before. Should have taken picture of the booth to show you XD I was too excited to see all the bling bling from that shop till I forget to snap photo of the booth. It accessories my iPhone and it is meant to put on the earphone part. It's kinda a trend now. My iPhone 4S is pretty now :D iPhone 4 and iPhone 4S is of the same size so it's really easy for me to get a cover here. I usually bluff the sales person and say my phone is iPhone 4 when I'm looking for cover (in case they wanna cheat me the price of the cover =____=). But if you're smart, you can really tell a difference between iPhone 4 and iPhone 4S. It's really obvious now that I've seen my iPhone 4S from inside out. They have Hello Kitty ear cap too? Haha. Would like to see one. I scared too many Hello Kitty look messy haha. Superb case. 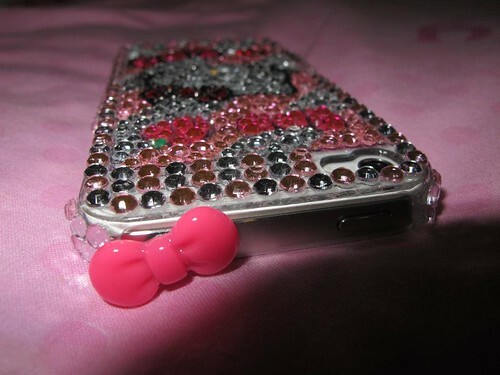 I must buy this for my iPhone 5. Where i can buy this.? Hey I got it from Malaysia :) I think you can order it online as well.